Russ Berrie Ruffles Bunny is a Retired and Rare plush from Russ Berrie. I would estimate it to be at least 10 years old or older. It comes from my Retail Store stock. 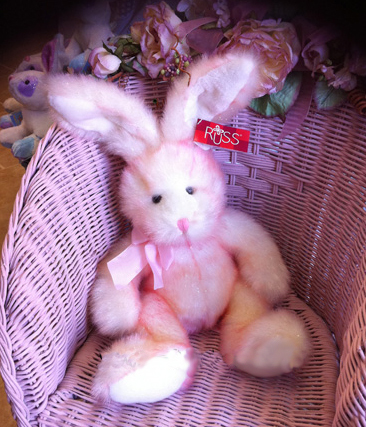 Russ Berrie Ruffles Bunny is a beautiful multi color cream and cotton candy pink with sparkles. It measures 18 inches from the top of his ears to the bottom of his feet. This adorable bunny is very soft and fluffy. His ears are bendable. It comes from a non-smoking retail environment. It has all tags (both hang tag and tush tag).